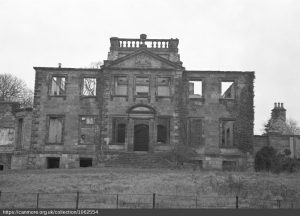 Largo House in Upper Largo, Fife, is an absolutely stunning building, even in it's broken, dilapidated, abandoned condition. To walk around it and wonder at it's grander days, to take in its inspiring architecture it truly is intoxicating. It was that very experience that led me to start this website up and cover the history of this stunning building. So where did the architects get their inspiration from? Some experts believe it is modelled on the "Shawfield Mansion" design. 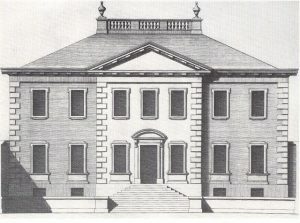 This was a house designed by Daniel Campbell of Shawfield, Glasgow in 1711. Other experts believe it to have been designed by James Adams and yet others say John Douglas. Either way, its design is stunning. At a later date, further wings were added in 1814 and 1831, a conservatory was also added to Largo House, making it less like the Shawfield mansion but still stunning nonetheless. Robert Adam along with his brother James Adam were sons of William Adam, an architect. Both brothers took up being architects and produced many notable designed. Some of these designs were published in the magazine "The ruins of the palace of the Emperor Diocletian at Spalatro in Dalmatia (1764)". James Durham married Anne Calderwood, her parents being the noted diarist Margaret Calderwood and her husband Thomas Calderwood. Now Anne's father, Thomas Calderwood, was a subscriber to this magazine and the mother, Margaret had a funerary monument made for her by Adams. So Anne Calderwood was familiar with Adams work and no doubt would have mentioned this to James Durham at some point. Anne also commissioned Adams to enlarge their Polton estate and "Georgianise" it. Also at the front of the house was a square stone building about 3 feet high. On this building was a 32Lb cannon which was raised from the wreck of the Royal George and presented by the Board of Ordnance to the late General Durham. Now unless I am mistaken, his relative 19 year old Philip Charles Durham (1763-1845) was on The Royal George when it sunk in 1782 at Spithead. At the time, Philip Charles Durham was lieutenant of the watch and so arguably was the most to blame for the sinking. That same year, 1782, a Charles Spalding recovered some of the cannons (for which the Board of Ordnance paid salvage) and later around 1837 the Deanne brothers recovered further cannons. Because an article in the Fife Herald on 6 April 1837 referred to the cannon having been installed the year before (1836) it's possible the cannon came from the Deanne brothers salvage of the wreck and not the earlier Spalding salvage of 1782. At one time there was a 6ft high by 3ft wide Celtic stone called a "Runie" with a cross on it with grotesque carvings on it on a stone platform at the front of the house on the lawn (Apparently at one time these were cemented into a wall there). It was put there by the Durhams. The cross was split into two parts, one part was found in 1839 the other some years later. These had been found about a mile apart in the nearby area. I hear that this is now in the local graveyard.